all ages: must wear a leotard of any color and pink ballet shoes, pointe shoe study by invitation Hair must be up in a bun for ballet and out of the dancers’ faces for tap, modern & jazz. Coordination, musicality and strength are learned and practiced through creative imagery, storytelling, games, basic ballet steps and positions. This is a great class for young dancers who love to move, dance and express themselves. Dancers will begin to learn the basic principles and technique of ballet. They will learn positions and steps and execute basic ballet choreography to classical music. This will build the student’s ear for musicality and rhythm teaching strength and coordination. Dancers are encouraged to express themselves and explore the joy of dance through foundation-building ballet technique. 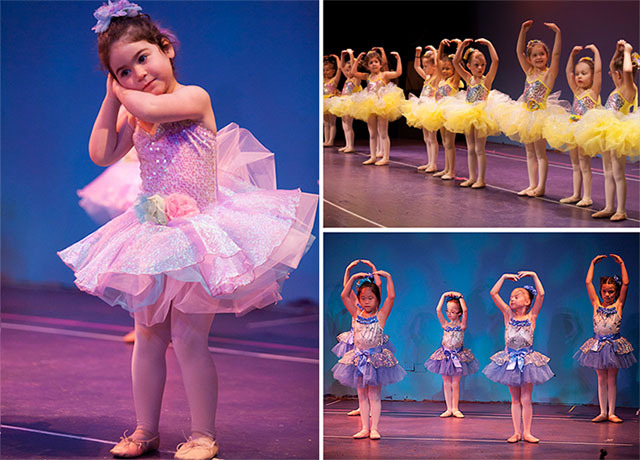 Young dancers practice their strength and coordination through basic ballet movement. They will start at the barre and move into the center learning a brief ballet combination in each class. They will begin to learn turns and jumps as well as basic ballet steps and choreography. For students who are continuing their studies in ballet. Ballet technique and musicality are stressed in this class as the student learns how to express him or herself through dance. Grace, coordination, strength and musicality are the focus as they practice barre and ballet choreography. For students who are continuing their ballet studies. Technique, strength, dynamics, and musicality are the focus of this class. Dancers will strengthen their skills with more complex barre and center exercises, and will learn to add self-expression and personal dynamics to their choreography. For motivated students with a minimum of four years of ballet. Technique, strength, dynamics, and musicality are the focus of this class, with an emphasis on preparing to go en pointe. Dancers must have a solid foundation in ballet technique. In Ballet IV, they will expand on skills from Ballet III, focusing on more complex barre and center exercises, as well as self expression and connection of movement. For students enrolled in Ballet 4. Dancers interested in pre-pointe must take two ballet classes per week. This class will focus on exercises to strengthen for pointe work. This class is given in regular ballet shoes. Dancers of all ages and levels are invited to take this class. Ballet barre, turns, jumps and combinations will be taught throughout the class. With an emphasis on self-expression and musicality, this class will hone your skills while allowing you to express yourself through dance.